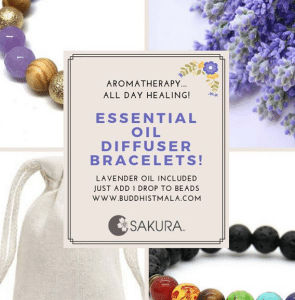 Sakura Designs hand makes all of our Sandalwood, Bodhi and Lotus malas here in the US, unless otherwise noted. 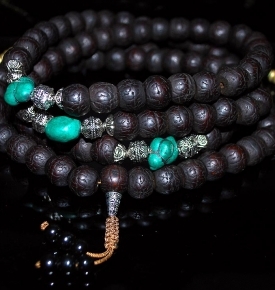 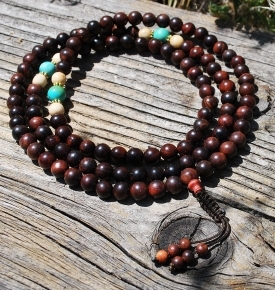 Tibetan Malas or Japa Malas are Buddhist & Hindu beads crafted from various sandalwoods and natural materials. 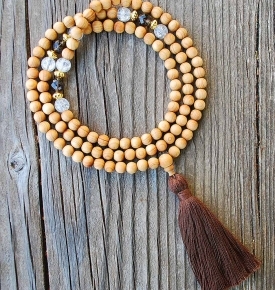 Free Mala Bag with our malas! 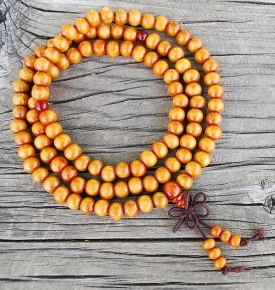 The specific use of Mala beads depends upon the tradition or even the practitioner. 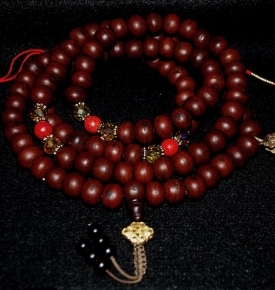 Tibetans believe in case a mantra (a prayer) is recited 100,000 times, the practitioner will gain the wisdom and purification from the mantra practice. 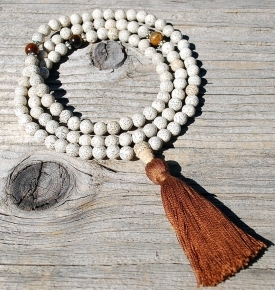 A mala for this specific purpose also offers counters to keep an eye on each round of recitation and something for teams of 10, as well as others could be put into keep an eye on thousands. 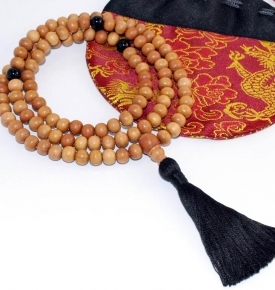 For a lot of other Buddhists, the recitation of the mantra, along with receiving merit which is then committed to all beings, is a kind of meditation, a focusing or sharpening from the mind. 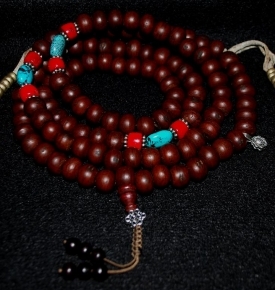 Additionally, it brings calmness and stilling towards the body. 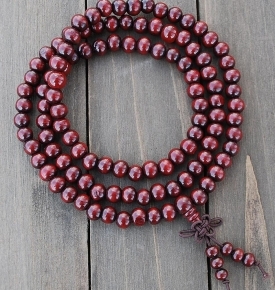 Hindus, when using the beads, never cross the guru bead, but turn back from the guru bead. 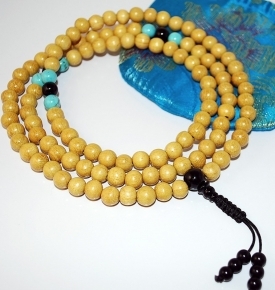 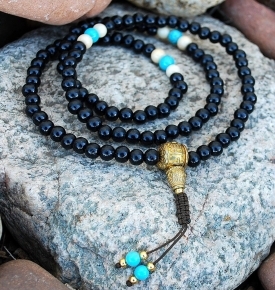 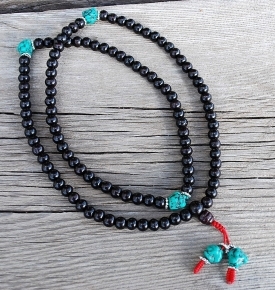 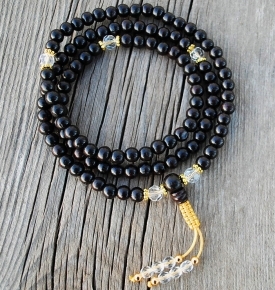 Buddhists also do not use the guru bead as a mantra, and it is skipped over out of respect. 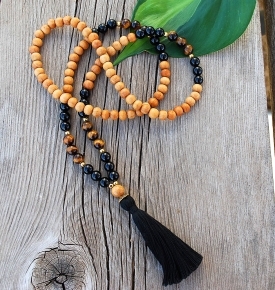 The beads are counted, one for every recitation from the prayer using the mala located in one hand as well as the beads counted using the thumb which advances the mala yet another bead and helps make the next ready for your count on the forefinger. 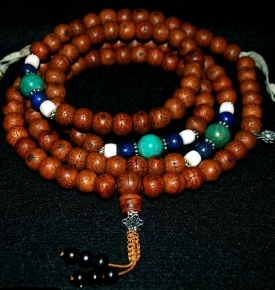 We’ve often seen it referenced the goal is telling 100 recitations using the extra 8 in case one did a number of them imperfectly. 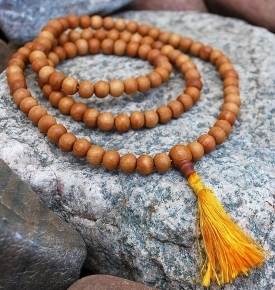 We actually do not accept that because the merit and openhearted-ness is gained from your reciting of mantras, regardless of how imperfectly said! 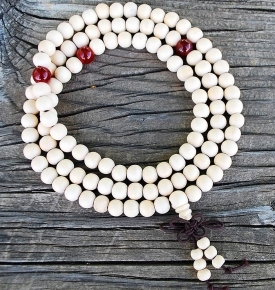 We believe it is the significance of the amount 108 towards the ancient numerology. 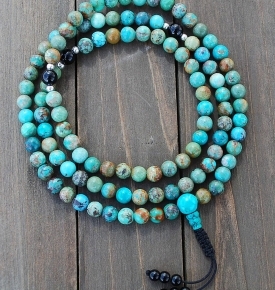 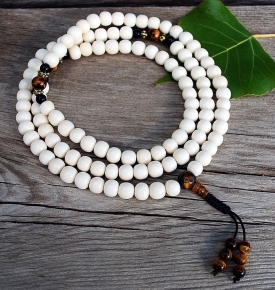 Connect to Inner Calm – with Mala Beads! 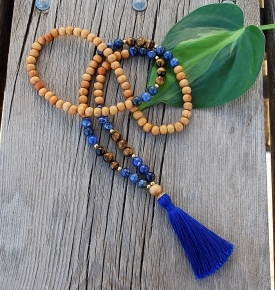 The practices of using Buddhist Mala Prayer Beads to clear and focus the mind by counting the repetitions of mantra chants are seen everywhere these days. 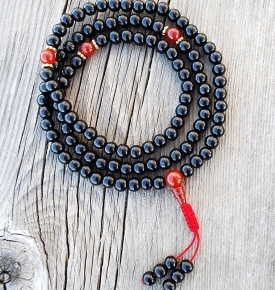 Anyone can use these beads, they are not limited to one religion or tradition. 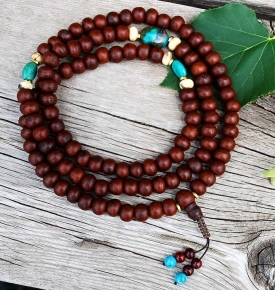 Mala bracelets of beautiful Tibetan beads, or perhaps a full size necklace of Tibetan Mala beads to wear or keep with you can remind you of your practice, a little secret a sacredness in our busy day! 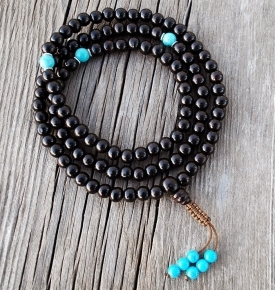 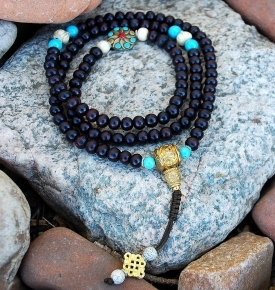 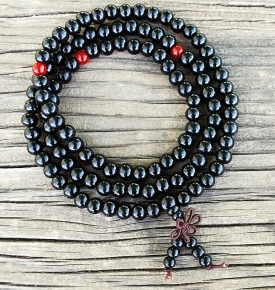 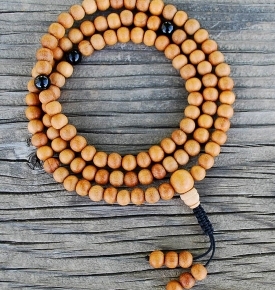 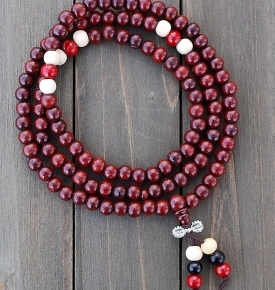 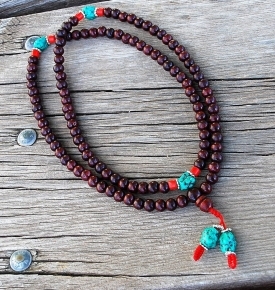 All classic Buddhist Mala Bead necklaces will have some sort of a tassel. 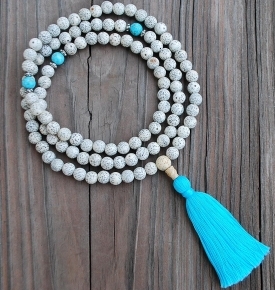 Sometimes the tassel is made of silk, cotton, rayon, or a Tibetan snake knot or adjustable knot in the more modern prayer necklaces. 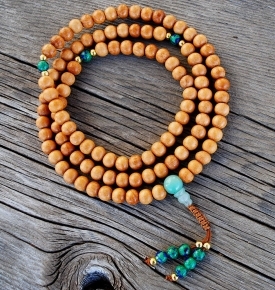 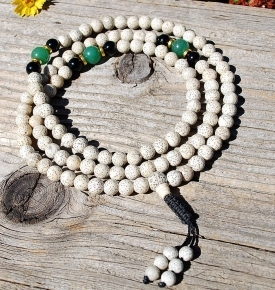 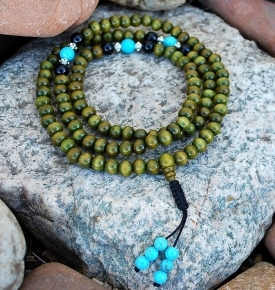 Possibly the most common gemstone to be found in necklaces of Mala beads would be any variation of hues of a Jade Mala. 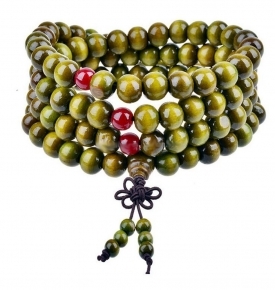 Jade helps to calm the mind, and it possesses powerful healing properties, such as enhancing love, courage, justice and wisdom, and has been used for centuries in prayer beads. 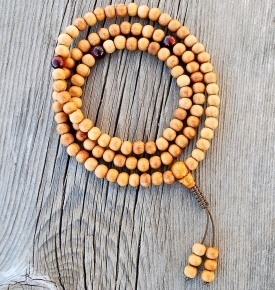 In addition to gemstones, our Buddhist Mala prayer beads are made from a wide variety of natural materials including bone, the exquisite wood or seeds from the Bodhi tree, crystal, pearl, even natural seeds … each one bringing their own beneficial qualities to the meditation practitioner depending on the intentions they set for their practice, or what mantra practice you are doing. 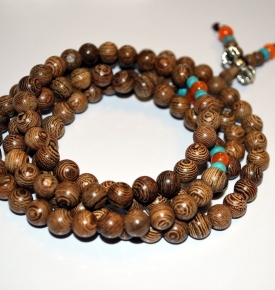 Enjoy and we hope you like our designs! 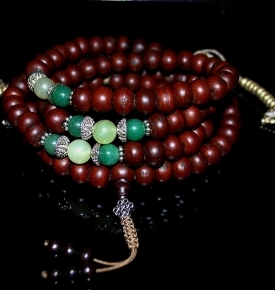 We can also custom create one for you, anytime!